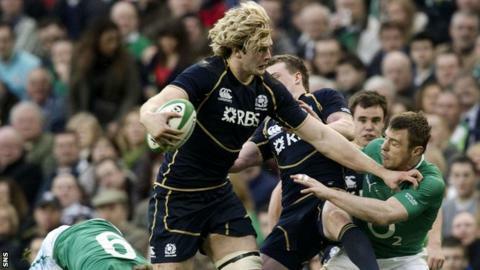 Richie Gray is an injury doubt for Scotland's opening autumn Test against New Zealand on 11 November. The 23-year-old Sale lock has damaged ankle ligaments and is expected to be sidelined for several weeks. Sale colleague Alasdair Dickinson will miss the matches against the All Blacks, South Africa and Tonga as he recovers from a shoulder problem. Fellow prop Moray Low is also out of the reckoning, along with Chris Cusiter, Duncan Weir and Joe Ansbro. London Irish centre Ansbro suffered a broken neck in a pre-season match, while scrum-half Cusiter and stand-off Weir are on a lengthy list of absentees at Glasgow Warriors. Rory Lamont is yet to return from a broken leg sustained in the Six Nations loss to France in February, with Graeme Morrison currently out with a knee injury. There is some good news for head coach Andy Robinson, with Saracens flanker Kelly Brown fully fit, having missed this year's Six Nations and summer tour.